The original Oil Filter adapter housing of the Rover K-series engine normally has a blanking plug in place in which you can install a sensor. 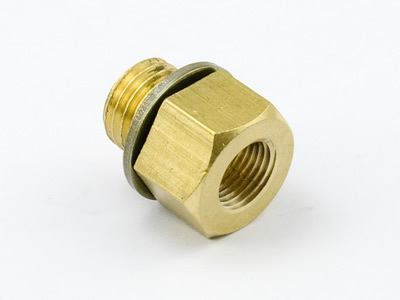 However.. most sensors are 1/8NPT thread nowadays and the thread in the Oil Filter adapter housing is M12 or 1/8NPT. Problem is.. you can't really determine which engine has one and which has the other. If you are planning on using this position for a sensor, this Oil Pressure Sensor Adapter will allow you to go from M12 thread to 1/8NPT. When installing this adapter, please use either a thread blocking liquid or use PFTE tape to stop the M12 thread from leaking.